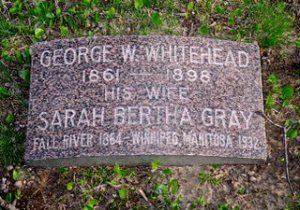 Sarah Bertha “Bertie” Gray Whitehead, half sister to the victim, Abby Borden, apparently got out of Fall River from time to time. In January of 1931 she crossed the border at Bridgeberg, Ontario. Going to visit her son-in-law, Charles Potter and her daughter Abbie Borden Whitehead Potter, Bertie had visited them before in November of 1929. The destination given is 512 Riverside Drive in Toronto. 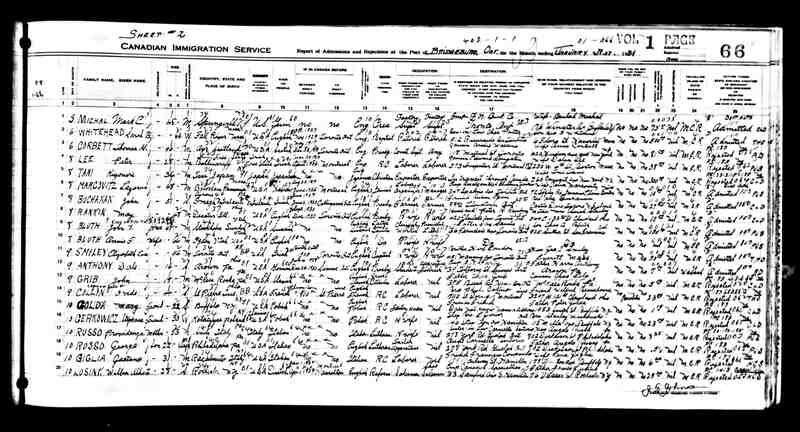 She lists her son George Whitehead and his wife as nearest relative living in Haverhill at 6 Flora Street and we learn the Whiteheads are Baptists. Always interesting to have these small details about the family of Abby Borden, and to know Bertie’s later life as a poor widow, contained some pleasurable experiences. Bertie’s daughter, Abbie Borden Potter would have nothing good to say about Lizzie Borden in years after. Bertie died not long after this trip in Winnipeg, Manitoba in her 68th year, only about a year older than Lizzie lived to be herself. Bertie is buried in Oak Grove Cemetery in Fall River, with her daughter Abbie and husband George Whitehead, and near the graves of her mother, Jane Eldredge Gray and her father, Oliver Gray (also Abby Durfee Gray’s father).